The Cars Helping Veterans website does not have a link to any financial information so I went to the Secretary of State’s website and found out that Cars Helping Veterans is one of seven organizations affiliated with a non-profit called Others First, Inc. (www.othersfirst.org) based at 1700 West Hamlin Road in Rochester Hills, Michigan (if you google this address, a building with the words “Charity Funding” comes up. Charity Funding, Inc. is a private company (which appears to be owned by a man named Rick Frazier) that assists non-profits with their car donation programs). In 2016, Others First, Inc raised $7.2 million from the NET sale of 20,592 cars and other vehicle donations. This equates to $348 per vehicle. So, the question is: What were the gross sales and what expenses were deducted (and paid to whom) to come to the net amount? Expenses totaled $7.1 million of which $5.3 million (74% of revenue) was spent on advertising and promotion, $1.1 million (15% of revenue) was given away in grants, $580,000 (8% of revenue) was paid to Charity Funding, Inc. (which appears to be owned by Rick Frazier) for day-to-day management of the charitable organization, and $120,000 went towards operating expenses, occupancy, insurance, salaries, transportation, and other expenses. Others First, Inc. reports having 1 employee who was compensated about $35,000. However, the organization paid Charity Funding, Inc. $580,000 for day-to-day management fees of the organization. Detail of the $580,000 is not available because Charity Funding, Inc. is a private entity. Grants of $1.1 million were distributed in 2016, 69 of which were $5,000 or more (totaling about $1 million). 51 of the 69 grants totaling $787,500 (11% of total revenue) were provided to veteran organizations. In summation, Others First, Inc. is a non-profit that collected $7.2 million in 2016 primarily from the sale of 20,592 cars and vehicles donated to the organization, which equates to $348 per vehicle. It is very important to point out the revenue from the sale of these cars and vehicles is a net number, not a gross figure meaning unknown expenses were netted out (and unknown to the reader of the IRS Form 990) of the sale before being reported as revenue. Others First, Inc. spent 74% of revenue on advertising and promotion. In other words, for every $100 in revenue collected from the sale of cars and vehicles, $74 went to advertising and promotion. $1.1 million or 15% of revenue went toward grants, most of which was given to veteran organizations which means that for every $100 in revenue collected from the sale of the cars and vehicles, only $15 went towards helping the intended parties – veterans, kids, pets, research, christian organizations, and cancer. And, finally it is important to point out that Others First, Inc. paid Charity Funding, Inc. $580,000 or $8 out of every $100 in revenue for day-to-day management. So donors beware: you may get the tax deduction for donating that vehicle but the majority of the proceeds from the sale of that donation went towards advertising and promotion and management fees. 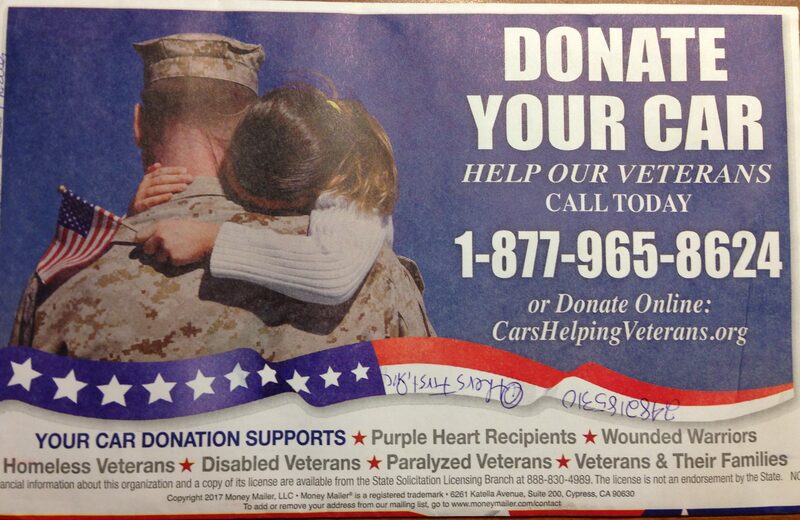 If you want your donation dollars to go further to help veterans, sell the vehicle yourself and give the money directly to a local non-profit (whose IRS Form 990 has been reviewed) that gives more than $11 of every $100 in revenue to veterans and their families. ← Where Does $100 to the Alliance Defending Freedom Go?